For this anniversary cake, I made 2 - 8" round layers of cake. One mix. Bake until done and cool completely. 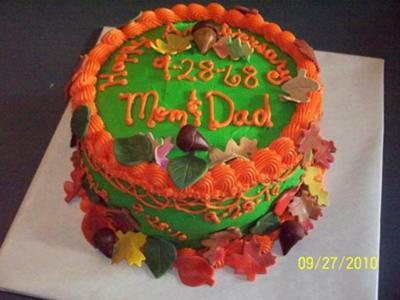 I iced with buttercream colored green with orange trim. The leaves are made of fondant and a few are gum paste. The acorns are fondant also. I put the dates around the sides of the cake.